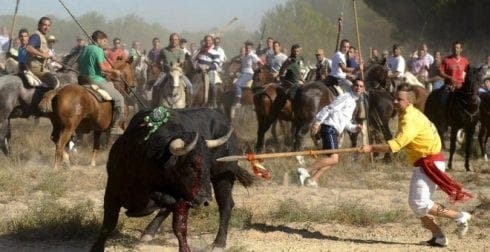 THE Spanish Supreme Court has put animal rights over ancient rites to end the torture and killing of bulls at a historic tournament watched by ‘40,000’ fans. Toro de la Vega is a medieval festival in the northern town of Tordesillas, Castille y León, in which a bull is hunted and speared to death. The ruling from Spain’s top court rejects the appeal of Tordesillas town hall, which had argued that there was no reason to put a ban on killing the animal. One of the arguments to support their appeal had been that a ban would eliminate ‘the essence of the popular rite that gave rise to bullfighting’. It was also argued that ‘40,000 fans’ attended the tradition, which involves cutting off the bull’s tail, compared to just ‘100 animal activists’. 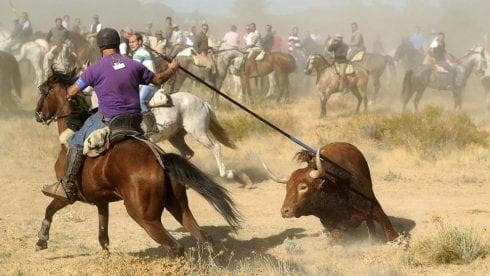 In April a decree was passed by the regional government, which outlawed the killing of the animal at the event. Following this latest ruling, Mayor of Tordesillas Jose Antonio Gonzalez Poncela said the council would be seeking legal support to see what ‘possibilities present themselves now’. Meanwhile, president of animal rights group PACMA, Silvia Barquero, welcomed the move and said the practice of bull torture ‘is not in accordance with the sensitivities of today’s society’. According to PETA, over 100 towns have banned bullfighting, while an Ipsos Mori poll found that 80% of Spaniards are now against the barbaric tradition.